While Verizon's handsets only fixes two issues, the Lollipop update for Galaxy S4 Google Play Edition has been spotted in Beta stage and should become available soon. While Samsung Galaxy S4 is perfectly capable to run Android 5.0 Lollipop, it seems that update is not ready to come out yet. For now, Verizon is rolling out only a minor update for this Android handset. Unfortunately, it only fixes two issues and nothing more. On the other hand, Samsung is already testing Lollipop with various older devices, including the Google Play Edition Galaxy S4. 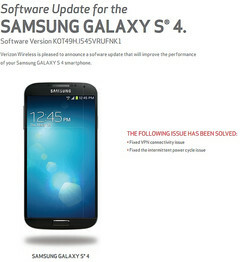 Verizon Wireless announced software version KOT49H.I545VRUFNK1 without too much information next to it. They say this update "will improve the performance of your Samsung Galaxy S4 smartphone" and that the VPM connectivity issue and the intermittent power cycle problem have been addressed. This patch may be already available in the Settings>About phone>Software updates menu or will soon show up as a notification. At last, SamMobile revealed that they installed a beta build of Lollipop on a Samsung Galaxy S4 Google Play Edition. This firmware features the stock user interface with Material design, as well as all the features added by Android 5.0. Unfortunately, no date of arrival for this update has been given. Anyway, since Google Play Edition handsets are the first to receive the updates, Verizon's Galaxy S4 will surely get its share of sweetness later. Now we only have to wait and see when will that happen.